E-mu Proteus 2 16-Bit Synth. Lieferumfang: E-mu Proteus 2 Orchestra, Netzkabel, Bedienungsanleitung. 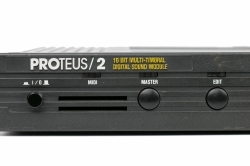 Emu Proteus /2 model 9012 (1990) 16 bit Multi Timbral Digital Sound Module. WAVETABLE internal 4Mb ROM (8 X rom ICs) 125 PCM waves at 39 kHz / 16 bits resolution. PCM wavetable is focused on orchestral instruments e.g. clarinet, cello, violin, timpani, bells, trombone, trumpet, horns, brass, harp, viola but also a bunch of basic waveforms (digital, square, harmonics, short-cycled).